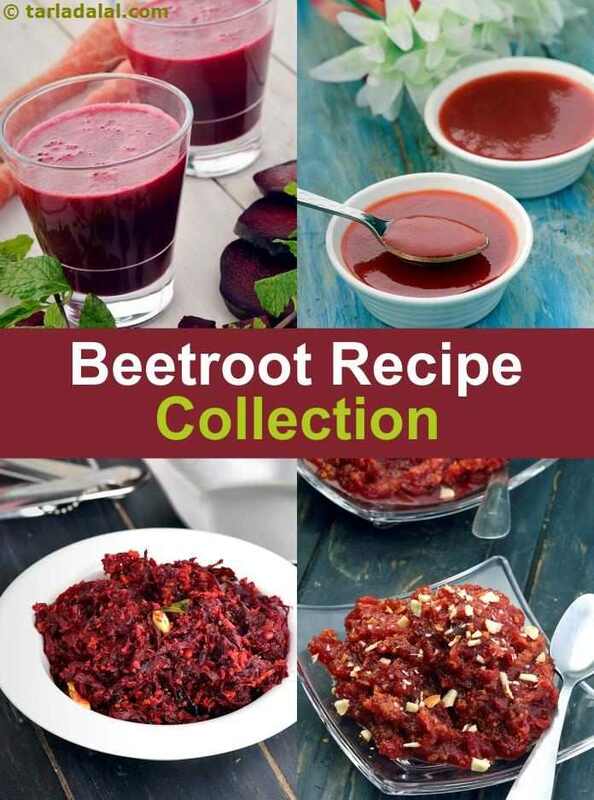 beetroot recipe collection. Indian beetroot recipes. Kids love the snazzy pink colour and pleasantly sweet taste of foods with beetroot while adults love this together with the fact that the lovely beetroot is healthy too! An underground veggie that is a deep pinkish-red in colour with a brownish skin, the beetroot is easily available everywhere and very reasonably priced too. It can be enjoyed raw or cooked, and adds a splash of nice red to any dish it is added to. Chopped, sliced or grated beetroot is a wonderful addition to most salads as it gives a sweetish taste and bright colour that make the salad very attractive. It can be made into soups and subzis, added to curries and rice dishes, and even made into a tasty halwa similar to carrot or doodhi. As you can see from the Top 10 Beetroot Recipes, the humble beetroot fits readily into Indian and continental foods. However, when using beetroot in a food you should be prepared for the colour change. Do not add it to a dish that you want clear, white or mildly coloured, because it effortlessly turns the dish a bright pink or red! Beetroot can be used to impart a nice sweetness to dishes like salads and dips. The slightly-sweet flavour of beetroot also works well with strong spices, because you get a nice sweet-and-spicy outcome! Due to its unique earthy and sweet flavor, beets are used to a great extent in different sides and salads. Raita is generally eaten as a side dish with Punjabi food. Raita a is basic mix of curd with cucumber or boondi, but you can experiment and make Beetroot, Cucumber and Tomato Raita that tastes much better than the rest. A quick sweetish pickle to give a tongue tickling taste to food is the Assorted pickle with shallots and baby corn. Salads are the ideal side or main dish for any meal of the day. Mixed Sprouts Healthy Salad is a combination of salty and sweet, crunchy and soft because of the salty feta cheese and mixed sprouts. The vibrancy of the vegetable brightens up hummus into an amazing Chickpea and Beetroot Dip. When a tasty ingredient is also healthy, it becomes even more attractive. Like most veggies, beetroot is also very good for you. It keeps your heart and body fit. From tikkis and rotis to risotto and raita, here is a unique collection of recipes using beetroot that you will love to bits! Enjoy the unique and wondrous flavour of beetroot with the dozens of recipes on our website. You will be able to discover the many facets of this seemingly simple veggie. Beetroot lends an exciting pink-red color to any food you add it to, eliminating the need for any food coloring. Beetroot Puri is made with pureed beets to the whole wheat dough. The puris that come out of this are not only of a beautiful color but also have a hint of pleasant sweetness to them. In Indian food it's very rare we get to see a subzi with beetroot but here we have the Beetroot and Coconut Subzi, a south Indian delicacy with simple flavors. Enjoy our beetroot recipe collection. Indian beetroot recipes given below. Two unusual ingredients, beetroot and dill, complement each other in this salad. Sprouted methi seeds add to the vitamin c, b complex, iron and calcium content and help keep the heart healthy. Sweet beetroot and perky dill are a wonderful combination, both by virtue of their contrasting colours and their complementary flavours. With a simple yet tasteful dressing of mustard and olive oil, this combo transforms into an aesthetic beetroot and dill salad.